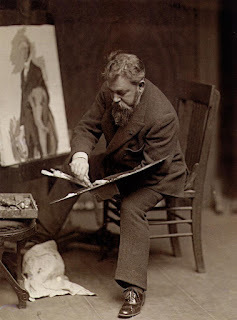 Sorolla was commissioned to paint fourteen monumental canvases by the American railroad-heir Archer Milton Huntington fill a room at the society – only minutes away in uptown Manhattan. Paintings which were meant to represent all the people of Spain in their various costumes and culture. It was a commission that would demand eight years of his life when he was at the height of his artistic power, and require constant travel throughout Spain in search of models and inspiration for what would eventually be championed as Sorolla's "Vision of Spain." Nearly 12 to 18 feet tall and over 200 feet in combined length, these canvases were painted in various locations throughout the country between 1912 and 1919. The final canvas, Ayamonte, was finished in July 1919. Sadly, Sorolla died before his murals could be installed in 1926. If you ever have the chance, visit the Hispanic Society and see these painting in person. They are just minutes north of midtown Manhattan and trust me when I say you will never forget them. You are right, they are awesome, Thomas, and they have a lot of other good paintings there, too. But alas, the Hispanic Society is closed for renovation until the fall of 2019! I was in NYC this past weekend and had to forego my usual Sorolla fix. Well, two days in the Metropolitan Museum was a good substitute, though their collection is very Sorolla deprived. This is a fantastic video. His use of color is just wonderful, and I love seeing the brush strokes. Thank you for sharing.